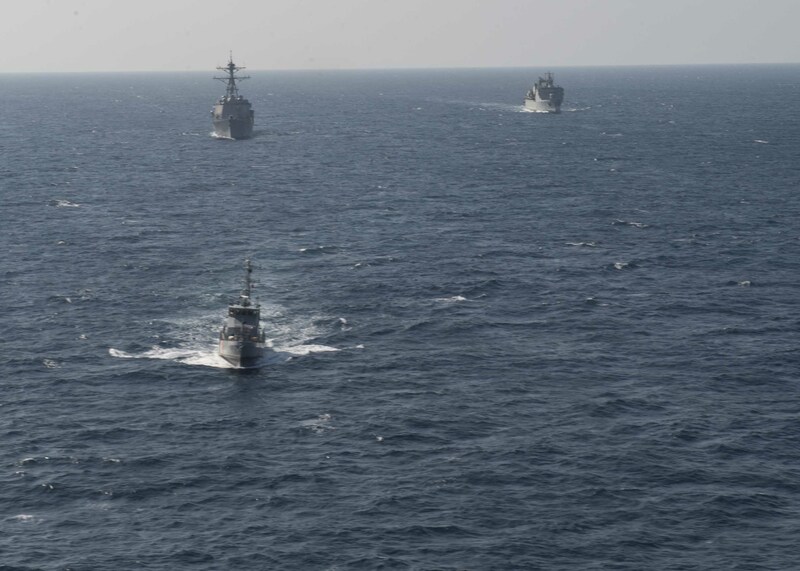 Naval ships from Saudi Arabia, Yemen and the United States have taken part in an exercise under the Command of Commodore Sajid Mahmood SI(M) of the Pakistan Navy. USS Dewey’s Seahawk helicopter and Yemeni Coast Guard boat YCG Sana’a conducting joint search & rescue exercise during Focused Operation Taawun al Behr. On 9 Nov 14 Royal Saudi Naval Force (RSNF) ship HMS Yanbu, Yemeni Coast Guard boat YCG Sana’a and USS Dewey, participated in a multi-national maritime anti-terrorism Focused Operation named Taawun al Behr, meaning Maritime Cooperation. All the units were under the command of Pakistan-led Combined Task Force 150 (CTF-150) based at Combined Maritime Forces headquarters in Manama, Bahrain. Commodore Sajid Mahmood SI(M) of Pakistan Navy Commander of CTF-150 expressed his satisfaction over the planning, coordination and successful execution of the Operation which had been one of his primary objectives since taking over command of the task Force on 14 Aug 14. Royal Saudi Naval Force Ship HMS Yanbu’s helicopter making approach over the flight deck of USS Dewey during Focused Operation Taawun al Behr. 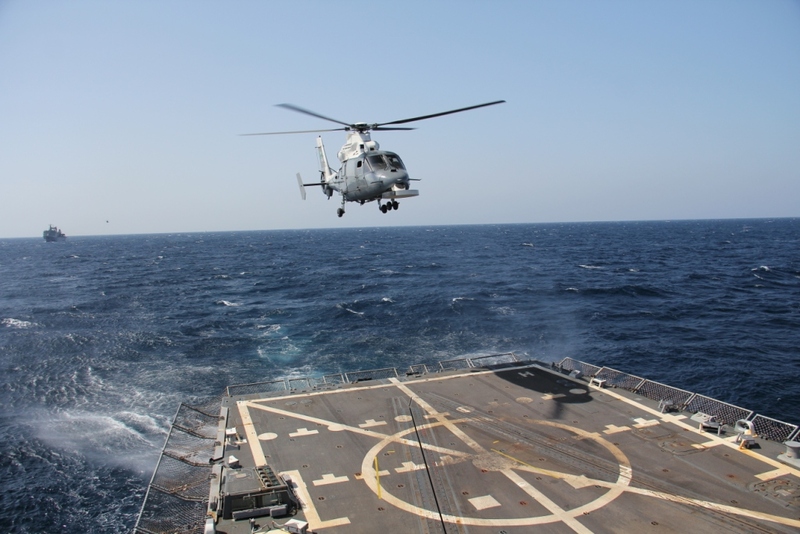 Conducted in the rough waters of Gulf of Aden it was aimed at CMF objectives, those of developing cooperation and building anti-terrorism capacity between regional states. 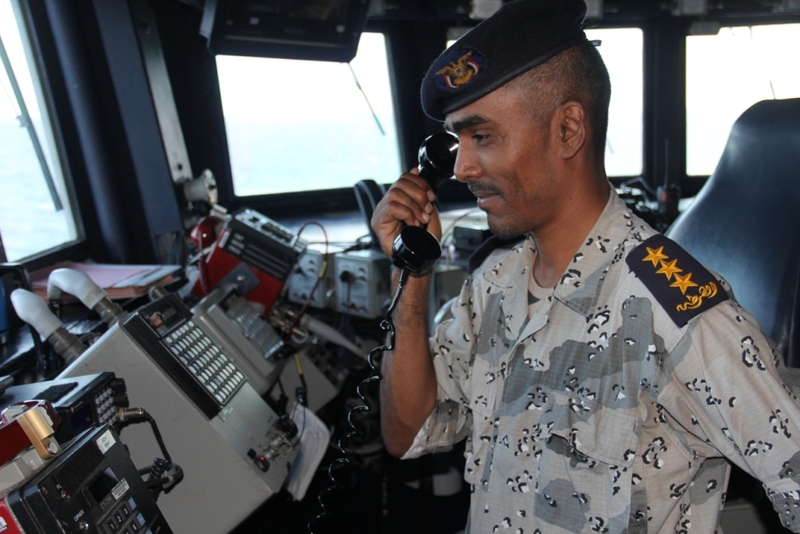 Over the course of the exercise, Officers from Royal Saudi Naval Forces and Yemeni Coast guard and Navy spent time onboard the American ship USS Dewey as sea riders to help improve interoperability between the ships staffs and to improve their understanding of maritime counter-terrorism operations. Yemeni Coast Guard Sea Rider carrying out query procedures on the bridge of USS Dewey during Focused Operation Taawun al Behr. 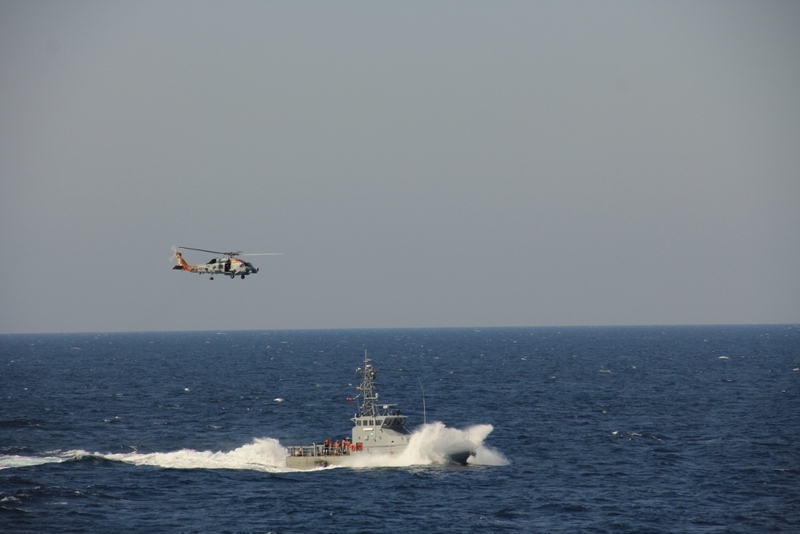 Naval operations such as small boat interdiction drills, search and rescue at sea, helicopter operations and ship manoeuvres were all conducted during Taawun al Behr. 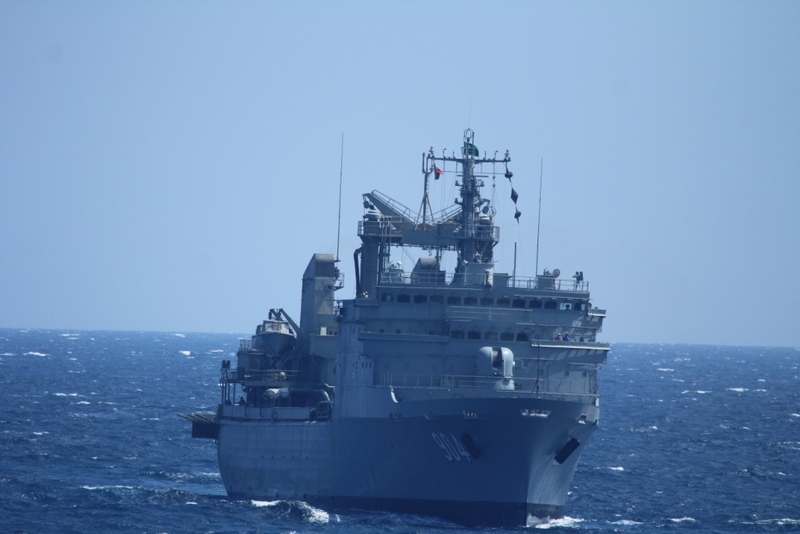 All the planned exercises and serials were aimed to provide increased maritime exposure to the participating naval units while operating in a multi-national environment. The USS Dewey, while taking on the role of a Merchant Vessel, provided various opportunities to test and rehearse other Maritime Interdiction Operation procedures. RSNF ship HMS Yanbu in action during Focused Operation Taawun al Behr. 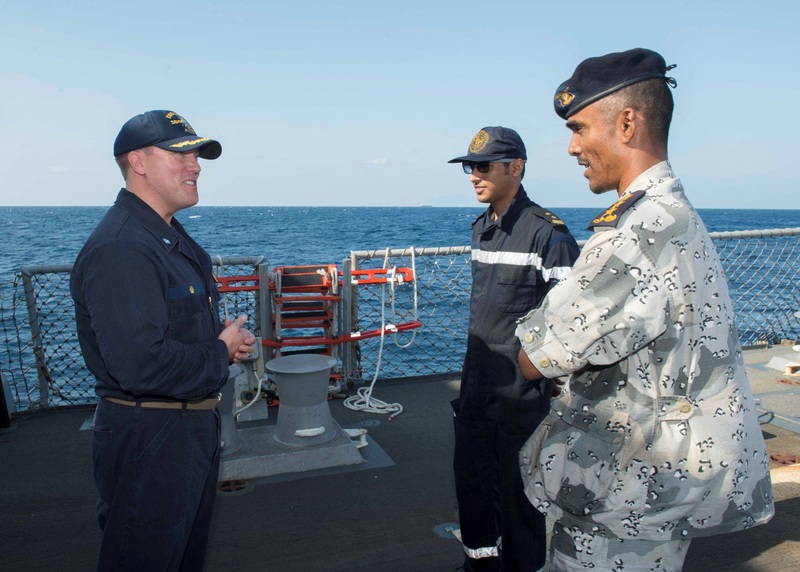 Commanding Officer of USS Dewey Commander Mikael Rockstad, meeting RSNF and Yemeni Sea Riders during Focused Operation Taawun al Behr. “Focused Operation Taawun al Behr provided an excellent opportunity for the Yemeni Navy and Coast Guard to enhance and prove their maritime skills while operating in coordination with the Royal Saudi Naval Force and the US Navy. I am happy that the Pakistan led CTF-150 contributed by staging this Focused Operation through concerted efforts and coordination, eventually making it a success while working closely with other CMF partners”. USS Dewey, HMS Yanbu and YCG Sana’a conducting manoeuvers during Focused Operation Taawun al Behr.